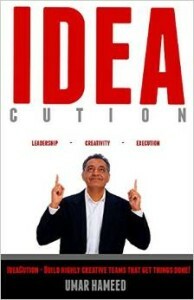 Umar Hameed, author of IdeaCUTION, will be the AHA BUSINESS RADIO guest on March 10th, 2015. IdeaCUTION is a book about leadership creativity and execution. Steve Jobs, Apple s late co-founder, once said: Innovation distinguishes between a leader and a follower. IdeaCution is a handbook that provides leaders with a step-by-step process for building and leading highly creative teams. It turns out that creativity is a science, not an art. The book applies concepts from Neuro-Linguistic Programming (NLP) to break new ground in the world of creativity. Bonus multimedia content that further addresses idea-creation and execution enhances this book experience. Readers get free access to the IdeaCution online archive. IdeaCution is ideal for leaders, entrepreneurs, corporations and community groups anyone who wants to create and execute game-changing ideas. As a process, IdeaCution starts with 10 proven, idea-generating tools that any team can use to develop hundreds of ideas in a single session. Members of the team use NeuroBoosters (Jedi mind tricks) like the Tesla Effect, which allows them to build and execute ideas in their minds, so they can make improvements before the first dollars is spent on development. Way too many ideas die on the vine because required action is not taken. The last section of the book addresses how to get a team to commit to an idea and then build a bulletproof plan for its execution. Remember, the best way to predict the future is to invent it. Read more on amazon.